1. Preheat the oven to 180°C, gas mark 4. Place the biscuits in a food processor and pulse to make fine crumbs. Mix in the melted butter and press into a 20cm round loose-bottomed cake tin. Place on a baking tray and bake for 5 minutes. 2. Meanwhile, cook the cherries in the brandy for 5 minutes, then cool slightly. 3. Whisk the soft cheese, ricotta, eggs and sugar together. Gently stir in the cherries and liquid to give a marbled effect. Pour over the biscuit base in the tin and bake for 50-60 minutes until just set. Allow to cool completely before removing from the tin. 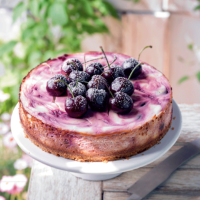 Chill for 1-2 hours before serving topped with the cherries and a dusting of icing sugar.